Have you ever wondered why your towels don’t smell fresh right after being washed or why your drinking glasses seem to have a film on them even after going through a cycle in the dishwasher? Some appliance experts say it’s not the machines that are the problem – it’s their users, who are literally pouring money down the drain by using way too much detergent. "Nobody thinks they use too much soap," appliance repairman and author Vernon Schmidt, recently told the New York Times. "Most people use 10 to 15 times the amount of soap they need, and they’re pouring money down the drain." Modern appliances use much less water than older models and, therefore, need much less soap to work efficiently. A spokesperson for the Association of Home Appliance Manufacturers told the New York Times that using too much detergent in the washing machine may make your clothes stiff, cause a build-up of mold and mildew as well as cause the machine to stop working properly. More isn’t better when it comes to using dishwasher detergent either. Experts say you don’t need to fill the entire soap receptacle up in order for your plates, glasses and flatware to get clean. In fact, too much soap can have the opposite effect. 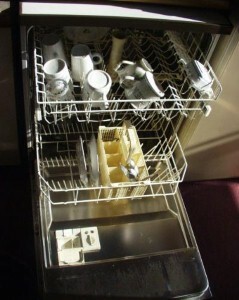 In addition, fathers can save more money by eliminating rinsing their dishes before putting them into the dishwasher. Experts say that, other than scraping off caked-on food, this extra step is unnecessary and only wastes water.